Place of death: Youngblood headquarters, Washington D.C.
Story: For reason that was not revealed, Marcus Langston was removed as the field leader of Team Youngblood and replaced by a younger version, Sentinel II, who came directly from the Bloodpool program . Sentinel II didn't last long. He died trying to kill Crypt by blowing up his nuclear powered exoskeleton while he held on to Crypt . 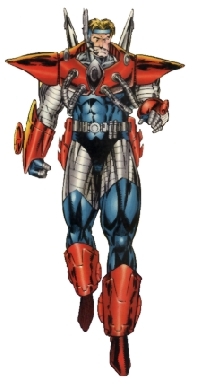 Equipment: Butler's armor was a new version of the original Sentinel's exoskeleton, which gave him increased strength, speed and flight capability. The armor also contained wrist blasters and force field generators.